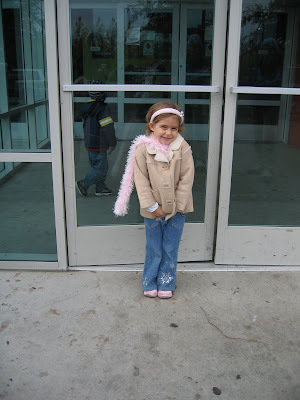 Our Faith Kids class had a field trip to the local ice rink today. Madeline was excited, although tentative about actually skating on the ice. 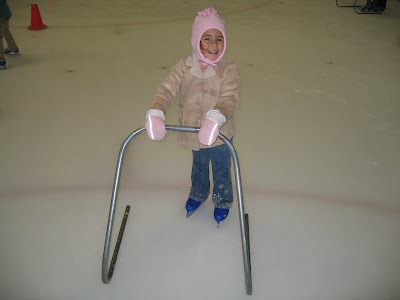 I reassured her that all the children would be learning how to skate, and most of the mommies, too. We were about to walk in the door for our icy adventure. The ice rink provided these "helpers" for first-time skaters. We were so thankful for some stability, and Madeline only fell once the whole day. 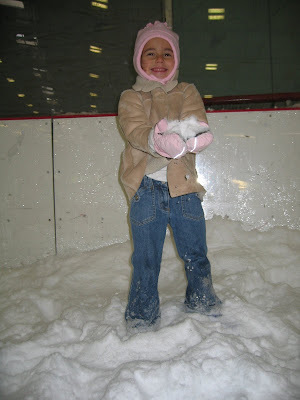 There was a wonderful pile of ice shavings provided for the kids to play in. They could make snowballs or just enjoy throwing the snow at each other. Madeline spent a good portion of the time here not even aware of how wet her clothes were getting. Here's our little skater. She did really well. 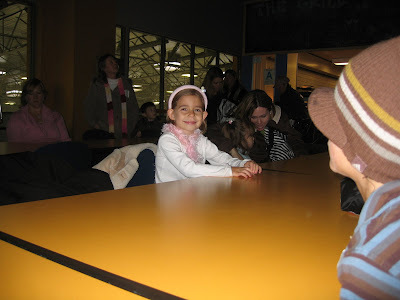 The kids were ready for their much anticipated snack break of hot cocoa and chocolate chip cookies. I consoled myself, while gobbling up my cookie, that I had burned enough calories on the ice to indulge with the kids. Is that willful ignorance? Yeah for Madeline! We will get her lovin that snow and she will need to go to Colorado and get the "real stuff" in mounds and mountains! Good for you, Madeline, learning to skate! Keep it up! 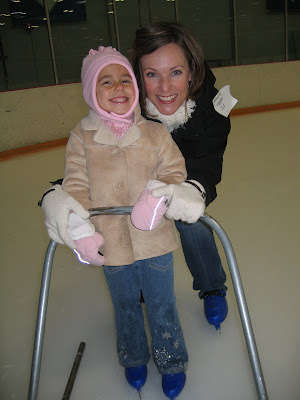 I meant to include in the former comment how beautiful you are, Steph, in the photo with Madeline on the ice rink! I believe it is one of the prettiest photos I have seen in some time. You are beautiful!